Cut the fish fillets in bite-sized portions, 1x1-inch. Place the fish in a container and season with chili paste or chipotle in adobo, butter, salt and pepper. Put the cornhusks in boiling water and dry them well. Put two of them together, but overlapping, to make a large rectangle. You should have four. In the center of each, place 1/4 of the fish. Wrap the fish like a tamale and tie the ends of the husks with a piece of the same panca or kitchen string. Place in a heat-resistant container. To serve, open the top of the tamales and serve two per person, accompanied by slices of cooked corn. If you do not find the cornhusks, use aluminum foil or parchment paper. You can accompany this dish with a green salad and sliced tomatoes. If desired, you can cook in a steamer for 20 minutes. 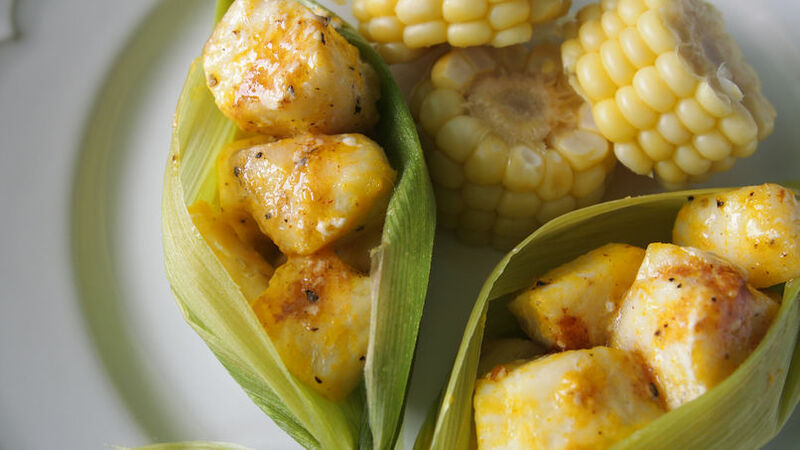 Wrapped like little tamales, this ancient fish recipe (sometimes seafood) is one of the oldest in the coasts of northern Peru and one of the most fun ways to cook fish. It is colorful, rich and makes a great dish for Lent. I cook this dish in the oven, but if you want to use your BBQ it will still be delicious, the same goes if you prepare it on the grill. As long as the fish is securely wrapped, it will be juicy and delicious. You can use whatever type of fish you like for this dish. I prefer white fish, because I think any of this type is great, but if you want to use trout or salmon then get to work and be sure not to overcook it. I do not recommend tuna because it’s delicate meat that is better kept for other cooking methods. I suggest this recipe for Lent with a side with boiled or roasted corn with rosemary and olive oil.